I love the entire Until series and if you've read them you know what they are all about. 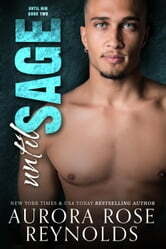 I love my men Alpha, bossy and dirty talking, Sage had it all. Just like all the Mayson men. Kim had a though time with her twin sister, her illness, being adopted. But in her own way she deals with it all, so for that all she is a very strong and brave person. I don't think I could cope with all of that as well as her. Also Sage is a very persistent alpha so he doesn't take no for an answer, Thank God!! In the beginning I was a bit worried with what happened between Kim and Sage, but I'm glad it isn't what I thought it would be. And also I was worried that that would be all the book was about, but I didn't need to worry. Aurora always delivers great alpha man with fantastic stories. Sage Mayson knows Kimberly Cullen is his BOOM when she meets her. But a misunderstanding makes him push her away and reject her. When he finds out the truth about what happened, Sage decides that Kim belongs to him and will do anything to win her back. Will Kim allow Sage back into her heart? Will she tell him her secret? I loved Until Sage! This second chance romance has a beautiful and captivating story, full of drama, laughter and hot, steamy scenes, with a dash of suspense! It hooked me from the first page and I couldn't stop reading. The chemistry between Sage and Kim is off the charts! Despite her health issues and her troubling birth family, Kimberly Cullen is a strong and independent woman, very sweet and kind. When she met Sage, she instantly fell for him. But his rejection made her wary and now she's afraid to let him get too close again. She has great adoptive parents and friends. I loved that she made Sage crawl a little before surrendering to him. Sage Mayson is a protective and possessive alpha. As soon as he met Kim, he knew she was her BOOM. But after being a jerk to her, he to work hard to win her back. He can be a little hot tempered, but he's also very sweet and gentle. He made me swoon a lot when he was trying to win Kim back. Once again, Aurora Rose Reynolds gives us an amazing book with a fantastic story and awesome characters. Her insta-love romances just keep getting better and her writing is flawless. She's able to make us connect with the story and the characters. I can't wait to read more! Easy, entertaining and racy read ...well worth it. Characters jump out of the book and provide pure entertainment. If you believe in the boom, you will not be disappointed with Sage! If you haven't heard about the boom yet, you are truly missing out and need to get on this right away Sage and Kimberly met, went way too fast, and then he messed up, big time. Be prepared, he messes up big again. Both of these play on Kim's fears, and even once he realizes he messed up, the first time, Kim isn't all that forgiving. She has good reasons, and he respects that, but his patience has a time limit This is all about forgiveness, not second chances, but forgiving. Both Kim and Sage are adopted, he always knew, she never did. She had a sister who stayed with her birth mom and had a horrible life. As much as she tried to connect to her, it never happened. Now her sister is gone, and Kim needs to forgive herself for her feelings. Her birth mother is a mess, her parents are amazing, and Kim needs to balance her own feelings about this all, while learning to trust Sage with all her parts Sage and his sister were adopted, and while his sister has sought out a relationship, and is having one, with their birth mother, he doesn't get it. He can't forgive her for what happened to them early in life, and has a full life and siblings and parents he loves. He doesn't need anymore, and blames his sister for pushing. He learns he needs to still love and support his sister, even if he doesn't understand. He learns he needs to listen to Kim and understand her, because he breaks her heart when he doesn't Sage and Kim were electric from the moment they met, and while Sage tried to take it slow, he learns life is too precious to mess around. Hot together, miserable apart, supporting and sweet when everything works out, these two truly are perfect for each other!